Thoughts from a Buttonmonger: How Tall Was Napoleon? 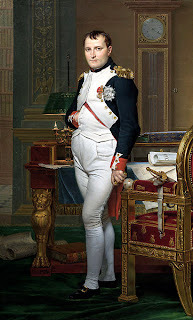 Contrary to popular belief, perpetuated by his nickname "le petit caporal," Napoleon was not especially short. After his death in 1821, the French emperor's height was recorded as 5 feet 2 inches in French feet. This corresponds to roughly 5 feet 7 inches in Imperial (British) feet, or 1.686 meters, making him slightly taller than an average Frenchman of the 19th century.